The TTI Staff came together to answer a few questions, cast a few votes, and ultimately diagnose the state of the ATP and WTA Tours heading into the new season. What will become of our 2014 Year-End No. 1s? Which players will rise from obscurity, and which will fall from grace to take their place? Who will emerge as Style Icon, Class Clown and, most importantly, Grand Slam champion? Check out the crew’s full picks compiled into a grid at the bottom. 1. Win a First Grand Slam title? It would be pretty naïve to predict anyone but Romanian No. 1, Simona Halep, to scoop a Slam in 2015. She went from strength to strength in a breakout 2014, and I think she’ll continue that form in Australia. It might be slightly left field, given how her debut final appearance came on the dirt of Roland Garros, but the Sunshine Slam always seems to throw up a few surprises and upsets. In my opinion Halep will come out unscathed. It’s got to be Halep. She is definitely ready to win a major title, with Roland Garros being the most likely (I don’t think Sharapova wins in 2015). With her all-court game, the other majors aren’t off the table, either. Halep proved her worth in 2014. She made valiant runs to the finals of the French Open and WTA Finals. The Romanian isn’t the tallest or strongest player out there, but she certainly knows what to do with the ball. Her on-court awareness and recognition of the optimal shot are uncanny. Halep’s game is versatile and adaptable to different surfaces and I like her chances of winning her maiden slam at the French Open. By every metric, Halep has gone about her last two seasons the “right” way. First cutting her teeth with wins at smaller tournaments, the Romanian built on her success, brick by brick. With coach Wim Fissette, Halep rarely turned a foot wrong in 2014. Hardly a week went by when she wasn’t achieving some sort of first: Premier 5 title, Premier Mandatory final, Grand Slam final. A spirited loss to Maria Sharapova in Paris showed she could stand up on the big occasion. A stunning win over Serena Williams in Singapore showed she could close the deal when opportunity knocked. With all the major openings last year, how a now Fisette-free Halep handles her fortnight Down Under will do much to determine whether I (among others) ultimately end up with egg on my face. Unpredictability has been a pillar of the WTA for almost a decade now, particularly in who breaks through. While it’s difficult to say who could find some magical form or the right place in an open draw at any of 2015’s majors, fortune has tended to favor the aggressive hitters in the past, so a player like Eugenie Bouchard would appear to be an intelligent bet. However, it’s possible that the world could sooner see Caroline Wozniacki pick up that elusive first Grand Slam title. She’s been in line as long as almost anyone (right, Jelena Jankovic? ), has one of the most deserving resumés, and showed to be close to her peak at the end of 2014. Wozniacki would – arguably – be the first true counter puncher to win a major title since Anastasia Myskina in over ten years ago. “Sweet Caroline” has the some of the greatest potential to make it happen. In all honesty, it could be either of Wozniacki and Halep, or perhaps even Agnieszka Radwanska. I’m going with Wozniacki by the slimmest of margins and based on gut feeling. Her upward trajectory since last summer did a lot to change my mind about her major opportunities. In all seriousness, we’ve repeated it ad nauseam. The leading candidates would indeed be Halep and Wozniacki, but did anyone really see Stan Wawrinka or Marin Cilic coming on the ATP last season? While the WTA had its share of unexpected slam winners in the past, could another one be waiting in the wings? Ekaterina Makarova? Lucie Safarova? Who knows. *Editor’s Note: To provide intellectual counterpoints to this pick, feel free to contact Ms. Chiesa at TheTennisIsland@gmail.com. 2. Become the Tour’s Hottest Rising Star? Given how 2014 played out on the WTA – with established players finding new life à la Ivanovic – I believe veteran Svetlana Kuznetsova will have yet another late-career spur with a deep run at a Grand Slam tournament – likely at the site of her last major triumph, Roland Garros. I would pick Belinda Bencic, but with her run to the US Open quarterfinals, I feel like that wouldn’t count as a surprise anymore. I’ll go a little further down the rankings and pick Aleksandra Krunic to back up her own impressive wins at Flushing Meadows. Nick Kyrgios and Madison Keys are cut from the same cloth. They both rely on powerful serves and ground strokes to beat opponents into submission. On any given day, Keys can hang with the best in the world and match them, blow for blow. We are still probably a few years away from the brightest young American making a push for a major title, but 2015 should be a fruitful year for the talented teen. At just 25 years old, Timea Bacsinszky finished 2014 in pole position to make a major rise up the rankings. Starting from scratch after a temporary hiatus, the Swiss star qualified for the French Open and Wimbledon main draws before getting a direct entry to the US Open on her own merit. Her best week came in the fall, when the former No. 36 took out Maria Sharapova before pushing Caroline Wozniacki through three brutal sets in Wuhan. Bacsinszky is talented, and playing for little more than a love of the game. Such a combination could lead to even more success in 2015. 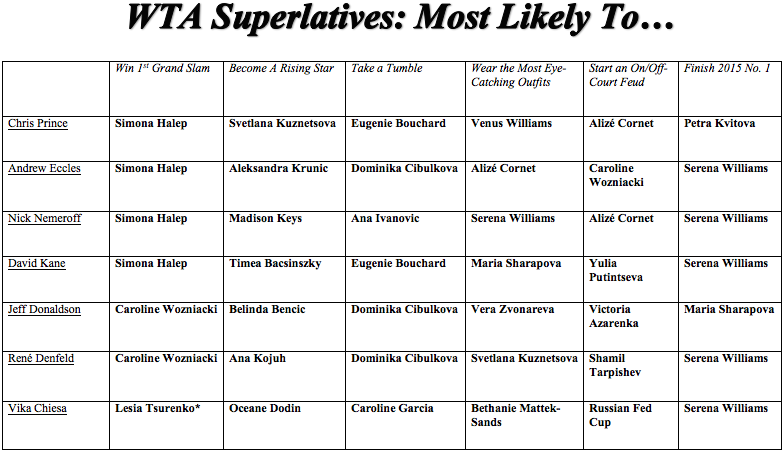 But there are just so many WTA Rising Stars™ to choose from! Beyond corporate cynicism, there really is quite an interesting crop of young ladies ripe for a rise up the WTA’s ranks in 2015. Assuming Bouchard and Halep can’t “rise” any higher, I’m looking at Ana Konjuh and Belinda Bencic to make big strides. More established players like Karolina Pliskova and Zarina Diyas could impress in the new year, but recent junior graduates demonstrated a steep curve of improvement – Bencic (WTA Newcomer of the Year) in particular made deep runs at big tournaments, sweeping aside several Top 20 opponents. It wouldn’t be surprising to see the new Swiss Miss and her stunning backhand take even bigger steps in 2014. Quite a number of possible choices, but I’ll go with Ana Konjuh. If the Croat remains healthy, she should be able to surge up into the Top 50 pretty quickly despite the age-restricted tournament play. I’ve talked a lot about her this fall, so I’ll stick to my guns. French teenager Oceane Dodin was a revelation at the end of 2014. She was ranked outside the Top 500 in early September; courtesy of two ITF titles, her biggest career final at the $100,000 ITF event in Poitiers, and a semifinal showing at the WTA 125 event in Limoges, she begins 2015 ranked No. 176. I had a chance to tune in to a lot of her in Poitiers and Limoges, and it certainly seems as though she has all the tools for success; she’s tall, strong off both wings and possesses a great serve. Her efforts earned her the French reciprocal wildcard into the Australian Open, and I hope to see her often at WTA level this year. There’s one caveat to Dodin’s success, however; she played just one match off of hard courts in 2014. 3. Take a Major Tumble? Eugenie Bouchard had an excellent time on the big stages, reaching the semifinals or better at the first three majors of 2014. Elsewhere on Tour, she often lacked stability. Those big ranking points at stake during her first established year on tour, and may bear too heavy on the young Canadian. Dominika Cibulkova. She’s still Top 10 as of now, remember. That will not be the case this time next year, I’m sure. I don’t trust Ana Ivanovic to follow up on her highly successful 2014 season. Her game is simply too susceptible to breaking down will make it hard for her to match the consistency she demonstrated last year. The one factor working in the Serb’s favor is that she made it to the second week of a major just once in 2014, meaning she’ll have less points to defend at the majors than other top players. It’s ostensibly easy to pick Bouchard as least likely to immediately follow-up on her meteoric rise. Her faulty week in Singapore didn’t exactly inspire confidence about her major league prospects. And yet her balanced, oddly enthusiastic assessment of a disappointing outing made me think otherwise, that she wouldn’t barrel head-first into her veritable sophomore season. What makes me choose her anyway comes down to the off-season. Losing coach Nick Saviano was hardly a tragedy in isolation; the Canadian seemed poised for a change, and players like Halep have shown themselves capable of consolidating success after a switch. But the time taken to pick a new coach spoke to a worrying lack of direction, at perhaps the worst possible time. Things ought to have been clear for the young Rising Star heading into this season, and early stumbles might beget more negative momentum in 2015. Plenty of players have anchored their high rankings on sporadic – albeit significant – results; from the youthful Bouchard at the first three majors to the ageless Flavia Pennetta at Indian Wells. While it may be difficult to defend all the points they acquired in binges during 2014, those two at least managed to spread their results out throughout the year, unlike Dominika Cibulkova, whose 2014 was extremely top heavy. Nearly 75% of her points were won in the first three months of the year. One can’t imagine her getting off to that same amazing start again. Thus a tumble down the rankings – and lesser seedings – is in the cards. Bouchard or Cibulkova might be obvious picks, but I’ll go with the Slovak nonetheless. Things could go pretty much awry for Cibulkova if she struggles to find her form ahead of Melbourne. Almost half of her points are from her Australian Open finals appearance, and an early exit could spell trouble and a much lower ranking for the rest of the year. It looked for all the world that France’s Caroline Garcia had turned over a new leaf in 2014; the enigmatic Frenchwoman won her first WTA title in Bogota, and had career-best runs to the quarterfinals of Madrid and Wuhan. However, those three results (715) account for more than half of her current ranking points (1341). The 21-year-old has a reputation of struggling with pressure, and it remains to be seen how she’ll handle these uncharted waters in 2015. She might be on the wrong side of the Top 50 by the time the grass court season comes around. 4. Wear the Most Eye-Catching Outfits? In the same spirit as the men the penchant for neon will be rife during the first half of the season. I expect our resident EleVen Queen Venus Williams to pull something spectacular out of the bag. And if all else fails at least we’ll be seeing a multitude of hideous throwback compression shorts to keep our eyes occupied. I am already looking forward to seeing Alizé Cornet‘s ever-present navy blue dress again. If she doesn’t wear it, I will be extremely disappointed. Serena Williams has a very bold approach to clothing, wearing things others probably wouldn’t and flaunting it with the utmost confidence and authority. My all-time favorite Serena outfit is the catsuit she wore at the U.S. Open in 2002. Though that was a Puma outfit, here’s hoping that Nike can match it in the new year. Once incapable of doing much wrong in the style department, Maria Sharapova‘s had some struggles in 2014, though her tennis came through when it mattered most. Her penchants for experimenting with waist-length and tunics have garnered mixed reviews, and the little black dress from this year’s US Open lacked the glitz and glamor we’re used to seeing from the Russian. Though the early images of her Australian Open attire haven’t been jaw-dropping, I’m optimistic that a comeback on court will eventually follow a comeback in kit. After a strong 2014 both on court and in fashion, Venus Williams will likely follow that form into the new year – although I wish more notable players would sign with her EleVen brand. Although, for worse, expect our eyes to to be caught up by Svetlana Kuznetsova and Qiaodan’s kits, and Camila Giorgi’s, well, lack of kit (all designed by her mom). Yet, based on what we’ve seen Vera Zvonareva cry-twirling and falling to the ground in at an ITF tournament this week, I think we’re in for a(nother) amazingly dramatic (and tragic) year for her and Fila. I have every bit of faith in Svetlana Kuznetsova‘s sponsor Qiaodan to turn 2015 into another very memorable year when it comes to the Russian’s kits. She returned to the WTA last fall, but Bethanie Mattek-Sands‘ full-fledged comeback is imminent; she’s using a protected ranking in Brisbane and the Australian Open. After all this time, she must be itching to reclaim her crown. 5. Start an On (or Off)-Court Feud? But those who will more than likely hit their fuse will be the regular ragers Alize Cornet and Sara Errani. “Why you say vamos?” Expect to see some epic racket smashes from Serena, and perhaps a blood pressure gate, part deux, between Sharapova and Ivanovic for good measure. I wouldn’t be shocked by a Wozniacki/Sharapova feud boiling up, especially if the Dane steals a few more wins, and even more especially given Caroline and Serena’s friendship growing ever stronger. Alizé Cornet is really fun to watch. She is far and away one of the most entertaining tennis players, and part of her reputation comes from the way she deals with umpires and linesman. It’s almost as if she’s knowingly putting on a show when arguing a call or complaining about something bothering her. Well, it’s clear where I stand from the Australian Love Triangle I pitched between ATPers Kyrgios, Kokkinakis, and Victoria Azarenka. Jokes aside, Azarenka‘s return to Tour will also mark the return of spice and feistiness to the off-court WTA. Remember when she was best friends with Serena in 2013? Enter Caroline. Remember when she and Radwanska had a falling out? Amazing drama. It’s clear she’s tried to turn over a new leaf, but her efforts to sing her way into our hearts may waken more savage beasts than soothe them. The Belorussian may indeed find herself in the middle of some sort of feud, or eight, next season. I’d put good money on Shamil Tarpischev dropping more clangers during Fed Cup 2015 after his comments in October of last year. 2) criticized the latter’s “Russian-ness” all those years ago? With Myskina now playing a large role in captioning the squad, and Sharapova reportedly taking part in Russia’s World Group first round tie against Poland next year, we’ll really get to see if the two have buried the hatchet. If they haven’t, the Russians could quickly continue their downward spiral. 6. Finish 2015 Ranked No. 1? The WTA is a slightly different story, in my opinion. I believe Serena Williams will commit her schedule to the Slams in 2015, given how relatively poorly she performed last year. Cutting down will inevitably reduce her ranking points, and whilst that could make way for Sharapova reclaim the top spot, she isn’t nearly as consistent as the likes of a Simona Halep. Petra Kvitova, then, is in prime position to finally grasp the top spot, and thanks to all the press attention the players will certainly be on the look out for her new-found confidence. Serena Williams truly has history on her mind now. She’s going to be firing on all cylinders. I could see Kvitova, Sharapova or Halep holding No. 1 for a while during the year, but when all is said and done at the end of the season, I think Serena will be safely perched at the top spot. Serena will retain the No. 1 ranking with relative ease. The American failed to reach the quarterfinals of the first three slams last year and should have no issue capitalizing on not having to defend many points in Melbourne, Paris, and London. It would appear that Williams is in quite a similar position to her ATP counterpart, Novak Djokovic. There are plenty of talented competitors who could could be the best over 52 weeks, but the American’s raw talent – 2014 Slams aside – remains miles ahead. After retaining the top spot for the entirety of last season, No. 1 might be less of a priority, and a comparison to Rafael Nadal might be more applicable. It wouldn’t be surprising, then, to see players like Sharapova or Halep make charges – however brief – for the pole position. But mix raw talent with the crucial consistency the living legend aspires to attain, and come season’s end, Williams will be the No. 1 left standing. Much more difficult to say than on the men’s side, where it was hard to think of anyone other than Novak Djokovic. In 2014, we knew it was be difficult for Serena to replicate the prior year’s effort – and she didn’t – but she still managed enough to rightfully maintain the WTA’s top rank. However, with her age and results wavering, I find it unlikely that we’ll see her end with the No. 1 ranking for a third year in a row, although that’s not to say she can’t or won’t get close to it. I don’t trust Petra Kvitova’s consistency, but I do trust Maria Sharapova‘s – she’s still in her athletic prime, has more accolades to achieve, and I suspect she’ll be able to string together consistently strong results on all surfaces with greater ease this next year – just slightly more than her closest rivals. A relatively healthy Williams has far too much ground to gain at the Slams this year for there to be any massive change. I do think there’s a chance that someone else might take over for a week or two, but overall the 2014 and 2015 Year-End No. 1s will most probably be the same player. While I think that it’s possible for Williams to lose the No. 1 ranking at some point next season, it’s also just as likely that she takes advantage of her early Grand Slam exits in 2014 and pads her ranking. If someone else wrestles the ranking away from her, I think she’ll take it back as the year reaches its conclusion.